Because remembering that I am already perfect is the thing I always forget. He held his mouth open yet nothing came out, his words held back by an invisible wall of resistance. He simply cannot step fully into the present moment. Too much investment in the memories of his haunted past to let go. An unwillingness to embody his truth, now, as King, instead honoring the old painful wounds he carries forth from his childhood and his ancestors before him. It's a feeling that most of us carry at one time or another. We need constant reminders to overcome the ongoing loop our brains feed us -- "I am not worthy to be King. My older brother would make a much better king than I. I cannot succeed to the degree that my father did or has expected of me." Haven't we all felt that before? Who was able to help this King? The speech therapist, Lionel, the embodiment of the 'higher self.' His credentials came from the realm of experience, not formal education. He was the guy who insisted that they regard each other as equals and see each other eye to eye. He was the guy who allowed his children's creativity to flow and entertained his kids with theatrical antics. The speech therapist's family celebrated the unhampered flow of creative expression. Just the opposite occurred in the castle where, as a child Prince Albert succumbed to harsh treatment and a lack of nurturing. He longed to create model airplanes and frivolously play with his brothers. He carried his suffering into adulthood, unconscious that this block of creative flow affected him every day of his life through his stuttering. His work with Lionel the speech therapist resonated with him ultimately in his heart. He knew the facts of his stature. He was royalty, dammit! He had a right to be King, yet he didn't feel it -- as he had been trained as a child not to feel. Lionel, on the other hand, was a commoner but could act the part of a King, say, if he got the part in a town play, or even of a self-assured doctor; which many believed him to be. The king needed some of that! He didn't really need speech therapy. He needed self-love! He held on to Lionel's self-embodied principles of self worth like a Linus blanket. Every stutter that he smoothed into words gave him more confidence; which translates into self love. The King sang through his stutter, said curse words through his long pauses, and did whatever else he needed to do to get the words flowing through his throat channel. He eventually cleared much of the stuck energy he held in his 5th throat chakra and became beloved King George VI of England. I wrote this wonderfully personal tale of rediscovering imagination called, Ruby Red Dragonfly, a couple of years ago. Since then it has been gestating deep within my hard drive. I printed a copy out of my computer about a month or so ago and have been reading it out loud to a group of hearty listeners on our weekly writer's call. I read one page of the story per week. At first I didn't think anything of this, my idea was a sort of dusting it off, bringing into the light of day. Well, it HAS been gestating because I find it is harder to read. There are a few reasons for this floating in my head. One is that reading one page per week is a bit grueling as it seems there is more gravity around WHAT I am reading and the story that I am telling. Like a poem, each word most be spoken with deliberation and feeling so that by the end of the page there is a hunger for what lies ahead next week. This brings me to my second reason for its difficulty. This writer's group that meets via conference call every week is more about EXPRESSING WORDS than the writing of them. I can feel the intention of the group when I join the call, it's a very focused intention that says, "Come on, show me what you've got! I want to feel it right here!" the intention says as it beats its fist against its heart, hungry to be fed, hungry to feel - love, joy, hope, forgiveness - to connect. That powerful intention is often met from this end with a squeak in the throat. I used to want to read things perfect the first time. Now I realize there is no such thing. Every time I read is different. Each word wants its moment in the spotlight. Each one wants to ride the wave of emotion all the way into my heart and into the hearts of every single person listening. That's where the squeaky throat comes in -- the stage fright. I'd like to say I read every sentence straight from my heart allowing all the emotion to flow through it. And that's where the beauty comes in, that's where I can see into the space that I am creating for myself in my writing and the reading of it. That's where I get to practice everyday as I read more, and as I write more. As I do this I become more familiar with the freedom in expression rather than the old, familiar, and quite frankly BORING experience of self-consciousness. That's why today I sit here, the fifth day in a row without a voice, and write all this down on the page. It's funny not being able to express through my throat. I can feel a pressing down between my throat and my heart as if there's a clog there. Whispering the words on the page to myself is not the same as a exploding through my vocal chords. The freedom of expressing myself through the READING of my writing feeds my soul just as much -- NO! even more than - all the peace, love, chicken fried steak, and mashed potato & gravy comfort food that my belly can muster. A few days ago my friend and Vedic astrologer, Marga Laub, mentioned in her newsletter that Friday night's full moon was about, "Healing the illusion of separation." I did not brace for any big lessons to show up on Friday night. I drove from Mineral Wells to Austin for a weekend breath circle and girl time. When I parked my car in front of my girlfriend's house in East Austin I skipped a step in my usual process - forgetting to lock my car. The next day after the breathing circle, the morning rain clouds had passed, the sun shone bright and my eyes squinted. I reached into my console for my sunglasses. They were not there. Where could I have put them. I pulled over and looked under the seat. I KNEW I had left them there. I felt an uncomfortable sensation throughout my body, one that felt like I had no support, a feeling of loss, a feeling that I had done something wrong. They had to be stolen. Then I remembered I also had my ipod in the console. If the ipod was gone then definitely someone had been in my car and taken my things. I felt nervous and violated as I pondered the concept of loss and the emptiness that accompanies loss. For a moment I steeped in this place and then wondered, "How can I get out of this funky place?" The first thought that came to my head was to do the opposite of what I was currently doing. Gratitude. That's when I started to think about the positives. Well, my windows had not been broken, my purse had not been stolen, my car had not been hijacked. It wasn't a violent break in. As break ins go it was very benign. It was not a confrontational robbery. I thought about having to hand those material possessions over to someone and I would have gladly done that with gratitude in exchange for my life. That's when the magnification of the loss of these items began to shrink to the size of a pea and I could really feel grateful in my heart. I pictured someone else with my things and had to laugh at the first feelings that surfaced which were very reminiscent of a breakup - imagining a lover loving another sort of feeling. I had to laugh, "It's a pair of friggin' sunglasses and a thingy I put songs and games on." Then something else happened. The thought of someone else enjoying these items made me happy. I thought, "Wow! If those sunglasses or that ipod can brighten someone's day, more power to 'em." I was able to feel love for these people instead of violation, grateful to them for reminding me that stuff is just stuff is just stuff. Who knows, whoever gets hold of that ipod may end up listening to some of the wonderful books that I downloaded (David Elliott's - Healing and Relutant Healer, Ken Wilbur's - A Brief History of Everything, A Course in Miracles) or some of the great music selections (Jimmy Baldwin's - Vivador). The next evening I ate dinner with a couple of friends at an outdoor cafe on East 7th. We watched the moon rise through the ancient twisted oak trees at the State Cemetery across the street. When I saw the moon I remembered..."this moon is about healing the illusion of separation," and I felt the oneness all around. Dragonflies have long been my touchstone in nature for gauging what's going on in my brain. This time of year they seem to have gotten a second wind, just as their summer reign simmers to a close there has been a flourishing of dragonflies to greet the sunrises and sunsets. On my morning walk today there were no signs of the dragonflies. A welcome early fall breeze reminded me of the constant movement of things - of everything. Wasn't it only a second ago that spring was in full bloom and I was ready to burst into the passion of summer? Movement with all it's go, go, go serves an important place in the diaspora of life on this earth. I walked up a steady, half-mile slope to the top of the hill. It was a slow burn - especially for someone who hasn't been engaging lately in all the joy that walking up this hill has to offer. I practiced my circular breathing, waved my hands to keep the circulation in my arms flowing, remembered to thank the sun, the beautiful moon, the incredible blue sky, and the trees. The trees. The cottonwoods edged the road all along my walk. Their leaves shimmered like hands clapping, or a cheerleader's pom-poms beating together to the rhythm of enthusiastic chant designed to inspire me. With their help I continued up that incline walking faster and faster, feeling it in my feet, my legs, even my shoulders. I thanked them, each and every one for their ability to motivate me and also for their service to nature as such magnificent beings. 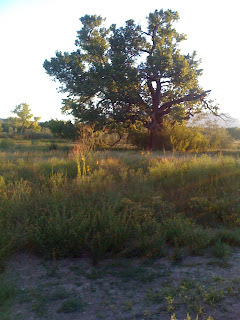 Their presence connected me in an instant to a moment in time merely a month ago in Abiquiui, NM where a grove of Cottonwoods along the Chama river welcomed me into their magical world at sunrise. Cottonwoods, alamosas (remember the Alamo?) are the grande dames of the tree world in the southwest. Their presence speaks volumes without saying much of anything at all. On the way back down that hill I reflected on the turning inward that is being requested of all of nature in this season of Autumn. I sometimes find that familiar old dribble in my mind creeping in to tell me I need to do more meditation, sit, be still. When I caught those mental monkeys this morning trying to convince me I wasn't in the "right" place or doing the "right" thing I quickly acknowledged the importance of balance. My heart opens a little wider with gratitude each time I consider the simplicity of nature. I stood at the gate at the end of my walk reflecting on the idea that flow is about constant movement - the yin and the yang, the ebb and the flow. Then I heard a voice say, "When it's time to sit in meditation, it's time to sit. When it's time to walk up that hill, it's time to walk. Constant movement, constant flow." I look up to see the first dragonfly of the day. One, only one, hoovering in the vibrant leaves of the cottonwood tree. I am often amazed at the capacity of my heart for forgiveness and rejuvenation. Having attended my brother and sister-in-law's wonderfully original and beautifully crafted wedding this weekend I was reminded that I don't have to DO anything or SAY anything to experience love and support. It's as easy as acknowledging that those elements are there - in the moment. At first I questioned myself, "Was I doing enough? Did I bring the right things?" A piece of me wanted to do more for them. Yet as I looked around and stood at the precipice that overlooked mountains in Arizona, Utah, and Colorado I realized that the best I could do is to be at peace in my heart. Forgiveness. Such a hard term to grasp because it involves my relationship with grace, nothing more - no one, no thing - just me and grace. Then I must sit with it - with silence in my heart. The rejuvenation it continues to bring is timeless and measureless. Just like the love that flowed from the top of the mountain overlook this past weekend deep in the four corners area of Colorado. 1. WHERE IS THE SNAKE? There's a rat snake living in our hen house. The snake and our chicken have developed a symbiotic relationship - nodding at each other as they pass the water trough. The snake eats the mice thus balancing the mice population and keeping the hen scratch in check. The snake also eats a few of the chicken eggs a week, a small pay-off for keeping the mice out of the garden and everywhere else. Since the snake moved in, I catch myself as I open the door and do a quick check-in - where am I? Where is the snake? If I don't see the snake before I go in, I am extra careful. I can feel my breath move through my body thus sensing any subtle movements more clearly that occur within the hen house. Where is the snake? It is a common question that has often been referred to when considering people who are less than honest or loyal (e.g., "He's such a snake!) and looking out for those types of people and being wary of them. This time the question refers to not what is "out there." Instead, it's within me. Going into the hen house now I am aware of a shift in my consciousness not only focusing my mind on being aware but also feeling my whole body being alert. In yoga there is a reference to what you learn "on the mat" and how to bring your experience "on the mat" to other areas of your life. For me the hen house is the same as the mat. When I'm in the hen house I remember how alert I can be when I want to be. I see my work as strengthening that alertness to occur in all facets and all moments of my life. With 25 days in a row of well over 100 degree temperatures, ice has become the great equalizer. Ice brings everything back into balance on super-hot days. It makes me feel supported, even loved. Ice. Nourishing and nutritious, it shifts the physical body into neutral when the skin is pink, the hair is wet, and the breath is short - especially when I'm running from the snake!